this is termed reciprocal induction. 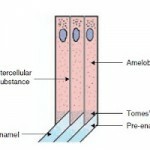 Amelogenesis occurs in 3 stages. third stage is called the maturation stage. There is morphogenesis and alignment of secretary cells. there are histological changes in cells which prepare cells to secret enamel . enamel is laid down in the form of Proteins and an organic matrix to form a partially mineralized enamel in the secretary stage. Growing crystals remove water resulting completes enamel calcification and mineralization. 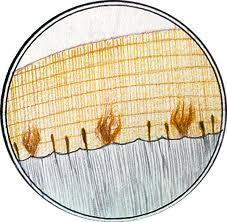 ameloblasts are polarized columnar cells. which is then partially mineralized by the enzyme alkaline phosphatase. 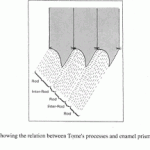 Allowing for the development of Tomes’ processes at the apical pole of the cell. resulting in a deposition of enamel matrix inside of each pit. the walls will eventually become interrod enamel. 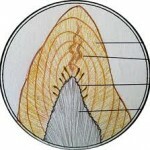 the orientation of the calcium crystals. 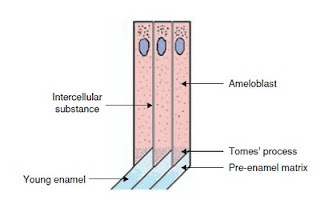 the ameloblasts transport substances used in the formation of enamel. 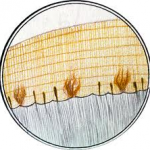 Microscopically, the most notable aspect of this phase is that these cells become striated, or have a ruffled border. Production, as in the secretary stage, to transportation. leaving enamelins and tuftelin in the enamel. By the end of this stage, the enamel has completed its mineralization. 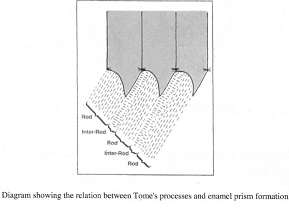 Prisms do not follow a straight path from dentino enamel junction to the surface. This entry was posted in Oral Care and tagged ameloblast, ameloblastin, amelogenesis, amelogenins, dentino enamel junction, enamalins, enamel, Hunter –Scherger bands, neo natal lines, tuftelins on May 17, 2012 by chzechze.